While both are shinny, most would agree that a diamond costs more & lasts longer than glitter. 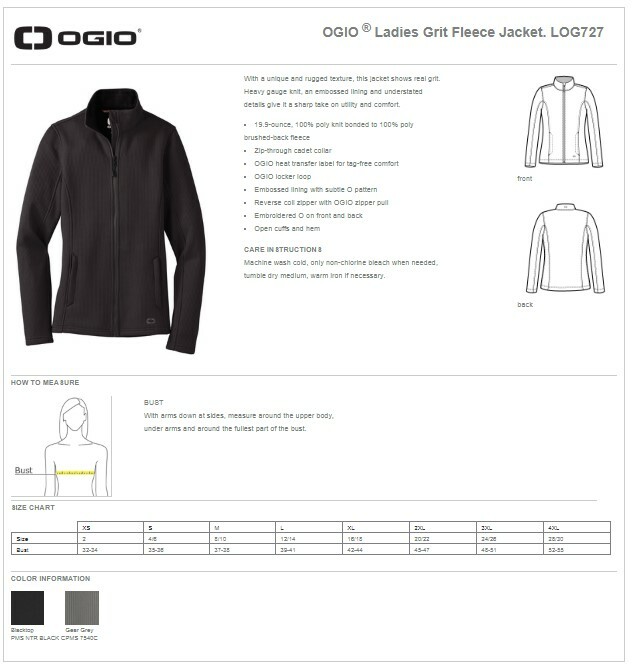 That shining example proves that there is a lot to see, as we show off these exceptionally designed Ogio women's full-zip fleece jackets. Upon close up inspection, attention to detail is borderline excessive. We congratulate Ogio's designers in their creating such a deliberately understated, unique feel & look for the exterior shell's surface. They call it grit, and it was woven from a heavy gauge knit. Flip this baby over to find the lining. It has been crafted, in part, by embossing the brushed-back fleece lining with a subtle O pattern. Additional extras include a zip through cadet collar. Sizes range from extra-small to plus 4xl. Bulk Pricing.